Look who stayed after all…. 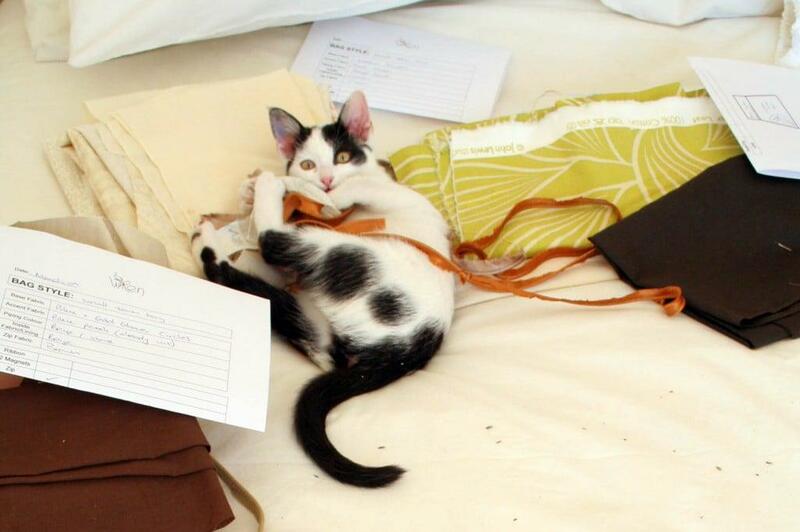 …to terrorise my fabrics and attack all the lavender pouches (the little black dots scattered on the bed are lavender). She is undoubtably the cutest thing ever and still without an agreed name: I call her ‘the little one’, Jeremy calls her ‘kitlet’ and on the innoculation documents she is called ‘Daisy’. I’m now leaning towards ‘Tumble’ after ‘Tumble weed’. What do you think? This entry was posted in Blog and tagged kitten, kitten playing, Lavender. Tumble! Love it. She’s beautiful. I know exactly what you mean. We got our cat, from the S.P.C.A and she was also called by various names (cat, kitten,sassy,kit etc) until we settled on KitCat! Not very creatve I must admit! Tumble is cute, and she seems to be doing just that! What about Mischief? Sweet picture and Tumble is a beautiful name! Really cute & she looks extremely mischievous. Friends of mine had no idea what to call the beautiful “kitty” so they used to call him “The Cat” and “The Cat” became “TC”. Tumble is great but I would probably put an “s” on the end TUMBLES. This seems to be a spirited one! I love how serious kittens are about playing!! !